Opening Times: 10am to 10pm (except on 17 November, when it opens at 5pm). Winter Wonderland will be closed on Christmas Day. You’d better watch out, you’d better not cry, better not pout, I’m telling you why… Winter Wonderland is coming to town. Winter Wonderland returns to Hyde Park in London for the 11th time on 17 November 2017, and this year promises to be bigger and better than ever before. Christmas is all about fun times spent with friends and family. What better way to welcome in the Christmas spirit this year than by heading down to Hyde park to peruse the Christmas Market while enjoying a cup of mulled wine. But that’s not all. 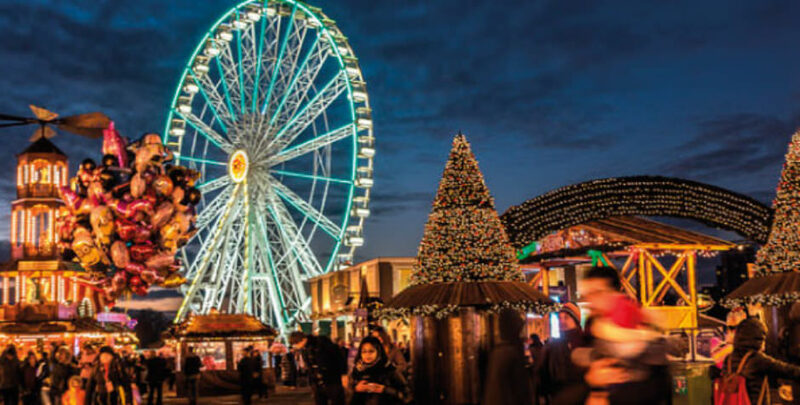 There is a host of fun activities for the whole family to enjoy, including the Winter Wonderland ice skating, big top shows and an observation wheel. The organisers have catered for everyone, young and old. If your kids are old enough, let them have a go on the carousel, helter skelter and the run around funhouses at the traditional fairground. Older children can strap in for an adrenaline-fuelled rollercoaster ride. They will be able to spend their pocket money buying tokens for the various rides at dedicated token booths. As always, Father Christmas will be making an appearance for all the young one to meet. Head over to Santa Land and step into Santa’s grotto to pay the old man a visit. Open every day until 6pm. Entry to Winter Wonderland is free of charge, however there are a few things for which you will have to pay a little extra. Below are the ticket prices which will vary depending on peak or off-peak times. Ice Skating: £9.50/£15.50 adult, £7.50/£10.50 child, £30/£32 family, £8.50/£14.50 cons. Magical Ice Kingdom: £7/£11 adult, £5/£9 child, £20/£36 family, £6/£10 cons. Giant Wheel: £7/£9 adult, £5/£7 child, £20/£28 family, £6/£7 cons, £40/£50 private pod, £55/£65 VIP pod. Circus Shows: £8.50/£15 adult, £5/£11.50 child, £20/£46 family, £7.50/£14 cons, £90/£105 private box for four. The Sooty Christmas Show: £8.50/£15 adult, £5/£11.50 child, £20/46 family, £7.50/£14 cons. Cinderella On Ice: £16.95/£19.95 adult, £12.95/£15.95 child, £51.80/£63.80 family, £15/£18 cons. As you can imagine, Winter Wonderland in Hyde Park is very popular and large numbers are expected to attend. If you are planning your trip into London, why not stay more than one day. B+B Belgravia is perfectly situated with quick access routes to all of the festivities.